As one strolls South on Columbus Street past the former Boyer Hotel across Granville Street from the Myers Inn Museum, the next three houses on the west side of the street have caused me many hours of research and literally 30 years of doubts. In 1815 William Myers gave his mortgage deed for 100 acres to Hezekiah Roberts to secure a note for $400 and a note for $500 in what was to become the village of Sunbury in 1816.1 Roberts put a cabin on the property and ran a tavern. Later the owners name is Rogers and later still Roberts. So who is this man? Following the Pennamite Wars (see the article about our Roots in Pennsylvania), William Penn’s heirs had the right to survey all unpurchased lands in Luzerne County and offer it for sale for a purchase price and interest. From April 1799 to May 28, 1805, Hezekiah Senior received five Land Warrants for a total of 306.135 acres in 5 different areas of Luzerne County.6 His son, Hezekiah Roberts, Jr. received 132.818 acres in April of 1799.7 In 1805 Hezekiah sold his 5 tracts for $40008 and eventually moved to Sunbury. In 1808 Hezekiah Roberts, jr. and his wife Catharine sold Plymouth Lots 11, 12, part of lot 9 and 82 acres of Avondale Lot 52 for £10008 or about $4300 and also moved to Ohio. According to the 1880 History of Delaware County, Hezekiah Roberts, Jr, bought 320 acres in Berkshire Township when he first came to Ohio. A few months later he sold the land to his father and in the spring of 1810, he bought 406 acres in Genoa Township from Joseph Latshaw. 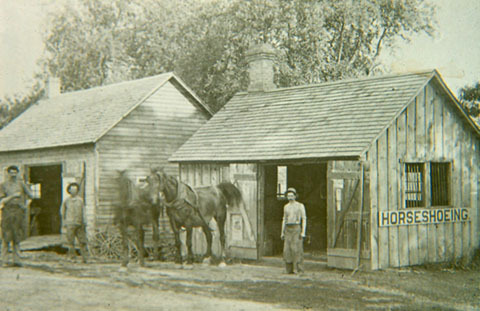 Roberts was a blacksmith and immediately put up a small log shop just east of his cabin which was the first blacksmith shop in the area. He continued to work it until his son was old enough to take his place. He stayed with his mother to look out for her. On March 2, 1837, John married. Phoebe Weeks. She was born in May 1812 in New York where her mother died. In 1834 she came to Ohio with her father 13 probably David Weeks.14 The couple continued to live in the house with John’s mother. John and Phoebe had 7 children. Four died in infancy. Mary E. was born in 1838, Pruella J. In 1841, and Euretta in 1846 who later married L. L. Thrall and moved to Licking County. Euretta had one child, John M. Thrall. When Phoebe was ill the Thralls moved in to take care of her and help with the farm. Phoebe died in 1874. I had always suspected the two Hezekiahs - one in Sunbury and one in Genoa were related but just figured out how when I found Hezekiah Senior's will. Since Genoa Township is also celebrating its Bicentennial, I thought you might like to hear a little of its history. Next week we’ll see how the Roberts and Rogers fit together in Sunbury's History. Area Historical Society. Page 9. 3. History of Delaware County and Ohio. O. K. Baskin & Co., Historical Publishers. Chicago, 1880. Page 853. 5. Blair. Ibid. page 451.